To order soft white wheat berries through our local co-op, click here to see our current order forms. We offer wheat berries locally very frequently, but not on every order form. If you’d like us to notify you when we take orders for wheat, sign up for our emails. We can also ship bulk spelt directly to you. Visit our store to have your order shipped. 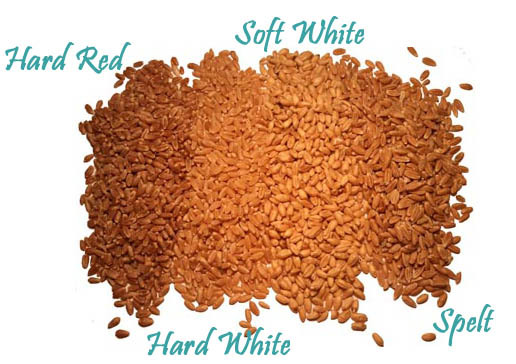 What are Soft White Wheat Berries? Wheat berries are the whole wheat grain. And ‘soft’ means the wheat berries have a low gluten content. A high gluten content is needed to make yeast bread, so soft white wheat is better for cookies, pancakes, quick breads, muffins, and other pastries. What is Soft White Wheat Good For? Most people use soft white wheat to mill their own whole wheat pastry flour, but you can also cook soft wheat just like you would cook rice. It makes a chewy addition to hearty soups, or serve it as a side dish like a pilaf. Soft white wheat tastes similar to Prairie Gold hard white wheat but is used differently. Because it is lower in gluten, soft white wheat is best for baked goods that should have a tender crumb, like muffins, pancakes, quick breads, biscuits and pie crusts. When I started milling my own pastry flour from soft white wheat, my muffins and pancakes turned out so good with 100% whole wheat flour that I was able to eliminate unbleached flour entirely. We offer Soft White Wheat in sealed 45 pound pails or 50 pound, 25 pound, and 5 pound bags. The pre-sealed pails of grain are sealed with oxygen absorbers inside. The grain inside will stay fresh for 6-8 years, and possibly quite a bit longer. Some people report storing the pails for 20 years or more. Of course, the pails must remain unopened to keep them that long. Once you open your pail of grain, you should use it up within a year or so and keep it cool and dry. Wheat that has been packaged in sealed pails will still sprout. However, the viability of the seed decreases with age, so the longer you store it, the lower the sprouting rate will be. These grains are also very clean, which is super important when milling your own flour since a small stone in the wheat could easily ruin your grain mill.